The GOP makes its counteroffer… And it (as well as the White House’s proposal last week) seems more geared to playing to the base… But if you split the difference between the two offers, you see the outline of a pretty serious deal… Boehner’s power move… Obama meets with governors at 10:10 am ET and then conducts an interview with Bloomberg News… And Team Romney’s regret -- immigration. *** Playing to the base: Congressional Republicans yesterday unveiled their counteroffer to the White House in the budget negotiations to resolve the looming tax increases and spending cuts that will automatically begin at the beginning of the year. That counteroffer, per NBC’s Luke Russert and Mike O’Brien: $800 billion in new revenue (through closing loopholes), $600 billion in cuts to federal health-care programs (so Medicare and Medicaid), $200 billion in savings by adjusting the cost-of-living increases in Social Security and Medicare, $300 billion in discretionary cuts, and another $300 billion in mandatory cuts. Given that the GOP proposal raises revenues -- but not rates on the wealthy -- the White House and Democrats immediately rejected it. "The Republican letter released today does not meet the test of balance,” said White House Communications Director Dan Pfeiffer. “Their plan includes nothing new and provides no details on which deductions they would eliminate, which loopholes they will close or which Medicare savings they would achieve.” But let’s be honest: Just like the White House’s proposal last week, this GOP move is largely playing to the base rather than being a serious offer. 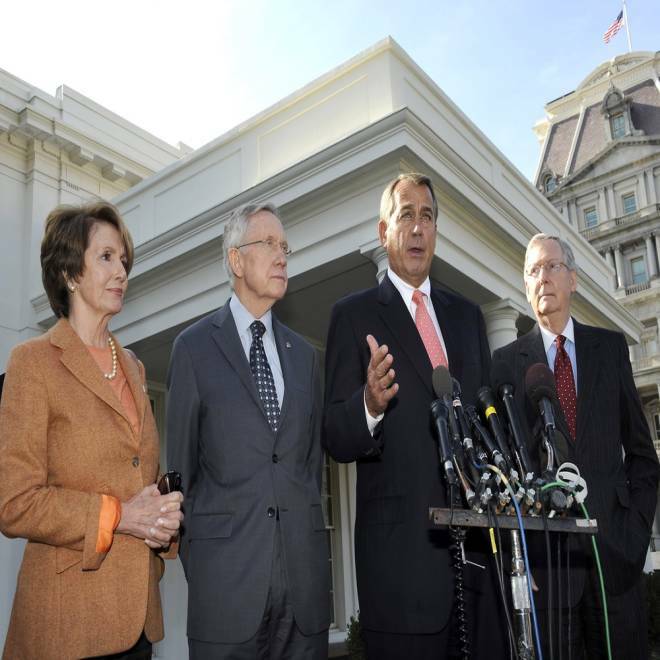 House Minority Leader Nancy Pelosi (D-CA), Senate Majority Leader Harry Reid (D-NV), Speaker of the House John Boehner (R-OH), and Senate Minority Leader Mitch McConnell (R-KY) speak to the media at the White House on Nov. 16, 2012 in Washington, DC. *** Splitting the difference: While the two proposals seem far apart -- and they are -- look at them when you split the difference between the two. You get $1.2 trillion in revenue and about $450 to $500 billion in savings to Medicare and Medicaid. And then say you throw in some stimulus for the Democrats (unemployment insurance, transportation spending), as well as the cost-of-living adjustments on Social Security for Republicans. That sounds like a pretty serious deal that both sides could live with, though it would look more like a “win” for the White House. Of course, Republicans would have to relent (in some form or fashion) on rates going up, while Democrats would have to acquiesce (one way or another) on the Social Security. In the New York Times, David Brooks sees a similar middle ground. “Republicans have to realize that they are going to cave on tax rates. The only question is what they get in return. What they should demand is this: That the year 2013 will be spent putting together a pro-growth tax and entitlement reform package that will put this country on a sound financial footing through 2040.” Folks, there’s definitely a way to resolve this. The only question is if there’s the will. *** Boehner’s power move: Speaking of will, check out this other news from Capitol Hill: “Four House Republicans have been stripped of their committee seats after it was determined by the Republican conference that they were ‘not team players,’” NBC’s Frank Thorp reports. More: “The decision made Monday during a meeting of the Republican Steering Committee strips Reps. David Schweikert (R-AZ) and Walter Jones (R-NC) of their seats on the Financial Services Committee, and Reps. Justin Amash (R-MI) and Tim Huelskamp (R-KS) of their seats on the House Budget Committee.” Pure and simple, this is a power move by House Speaker John Boehner and the GOP leadership to signal to their members that they’re in charge. Our question: Does the move enforce party discipline (especially in forging a fiscal-cliff deal), or does it backfire? *** Obama’s day: Today at the White House, President Obama and Vice President Biden meet with governors from across the country to discuss the fiscal/budget negotiations at 10:10 am ET. USA Today: “The president's guests include three Republican governors -- one of them Scott Walker of Wisconsin, whose battles with public employee unions made headlines throughout the recent election season. Gov. Jack Markell, D-Del., chairman of the National Governors Association, will also be in the meeting with Obama. So will the NGA Vice Chair, Gov. Mary Fallin, R-Okl. The other attendees: Gov. Mike Beebe, D-Ark., Gov. Mark Dayton, D-Minn., and Gov. Gary Herbert, R-Utah.” In addition, Obama sits down for his first TV interview since the election with Bloomberg News at 12:30 pm ET.